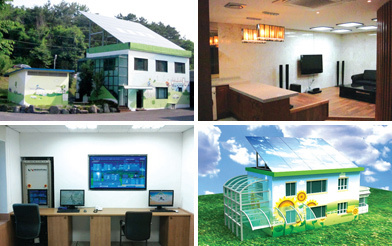 EM Korea makes effort to build an eco-friendly world for the better future. 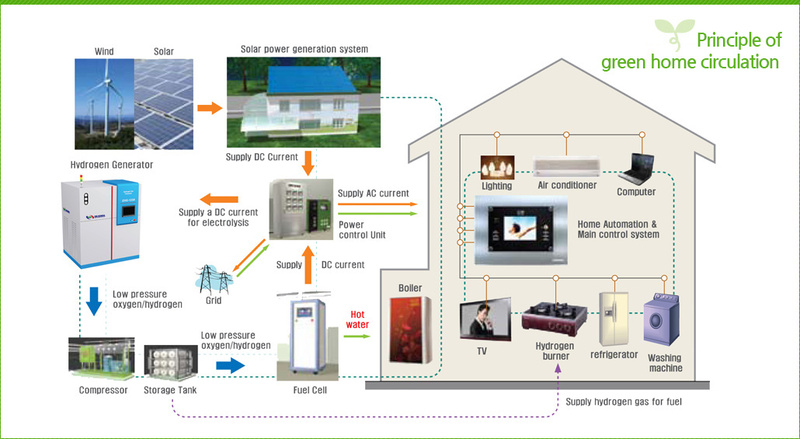 It is a group of hybrid green homes, The power left after consumed for housekeeping, originally generated from solar or wind, will be compressed and stored as form of hydrogen through water electrolysis system. The stored hydrogen can be transformed to electric power through fuel cell system when natural energy source is restricted, and the power will be supplied to house. In this way, the energy cycle will be endless. Energy sources Guided to install one of the solar energy, solar heat, fuel cell, geothermal, or others A vailable renewable energy sources are used complexly. Applied technologies Individual system technology Realize complex and various technologies and passive technologies on them. fuel cell - electric power, heating, etc. The combined installation of the components described on the left. 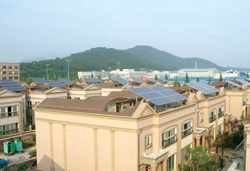 Green village is a kind of Energy Independence (carbon free) Village, that is, only natural energy source such as solar, wind or geothermal will be used to keep the home. 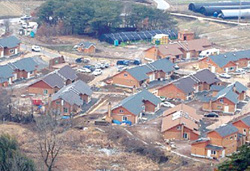 Energy consumption of the village is minimized by insulation, sun lighting, etc. technology with zero carbon emission. Water is electrolyzed by the electricity obtained from the solar energy or wind power to produce hydrogen. The hydrogen is then pressurized at the storage and the stored hydrogen is converted to electricity through a fuel cell. 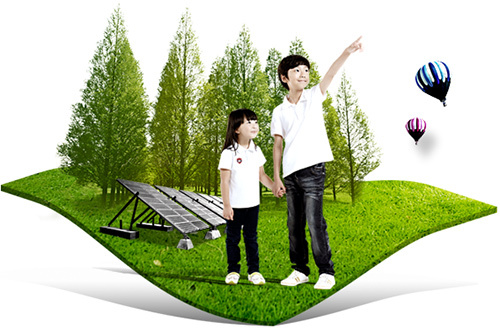 The energy circulates from solar energy, electricity, hydrogen and then electricity. This process has a concept that the energy can be used as a proper type at the proper timing. 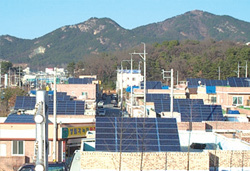 The green villages constructed with solar energy are in Buyeo-gun in Chungnam Province, Palyong-dong in Changwon City, and Shinhyocheon town.